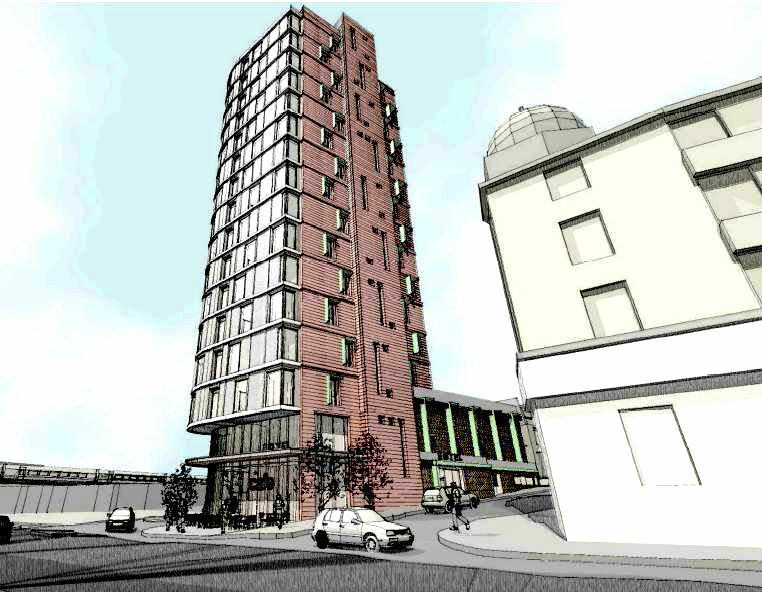 A new hotel has been proposed at the bottom of Mossbury Road, 155 Falcon Road (in front of PCS). We have already published an article detailing the planning application and the reason given by the developers/architect. 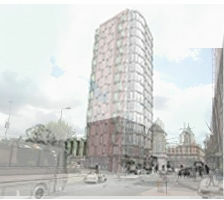 We have also published pictures of the proposed scheme. 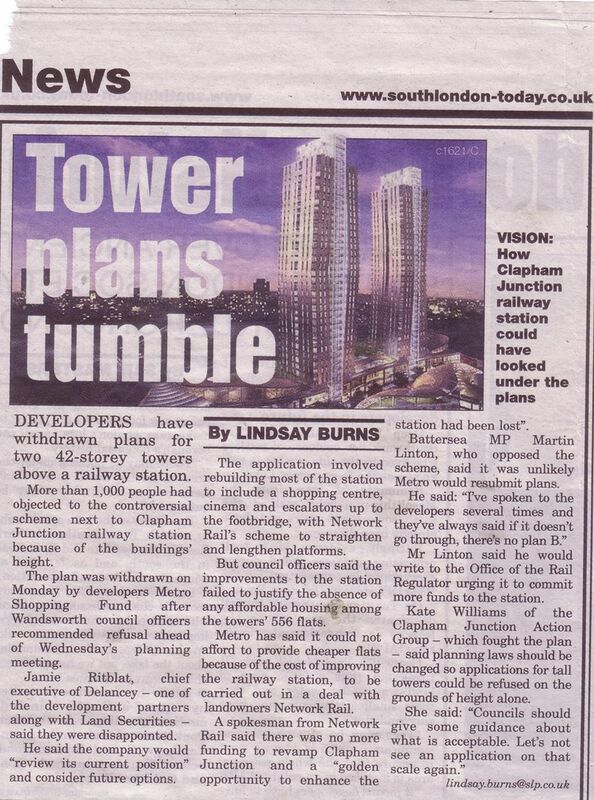 And is it going to create benefits and lead for future other redevelopments of Clapham Junction? 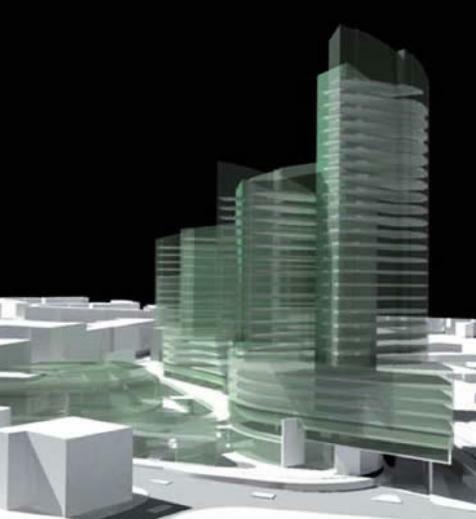 A development that will fit within the vicinity? The proposed site is very compact and lies at the bottom of an area of homogeneous Victorian and Edwardian low rise houses. Any development proposed to take its place should respect the historical and architectural homogeneity of its neighbouring buildings and not repeat the mistakes of the past: The Arding and Hobbs building is the focus for the Lavender Hill and Falcon Road junction and a landmark for the area. To have a building which towers well-over this building would be detrimental to the character of Clapham Junction. All of the exiting tall buildings lie to the North of the train tracks with none to the South. 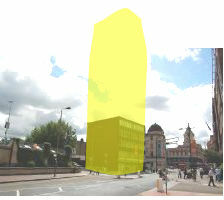 The 16 storey tower block will immediately become by far the tallest building this side of the rail track. 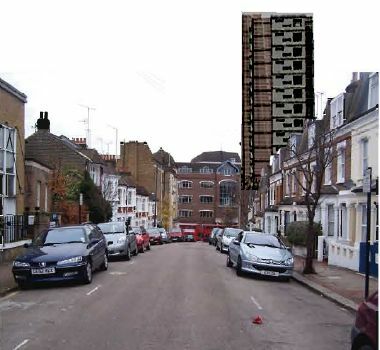 The existing towers, mainly estates from the 60-70’s, are in any event loved by no-one and, to quote a very many e-mails and letters to the Council in the recent months, are examples of what should not be repeated in the area. Last but not least, and probably the most important of all, you must consider the consequences of such a precedent. 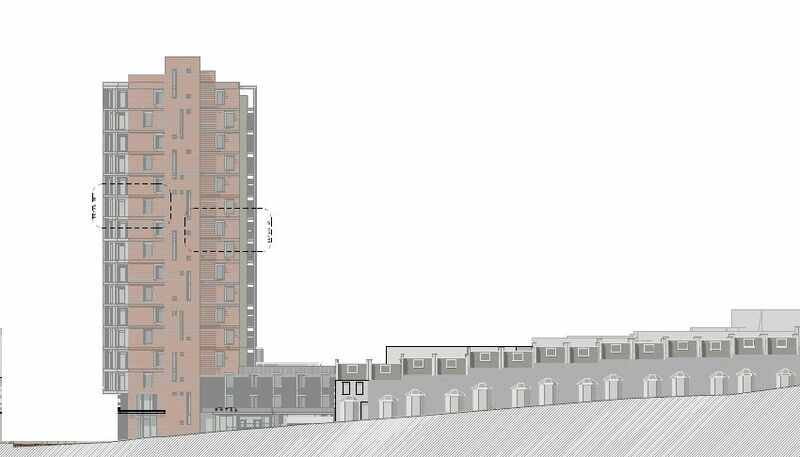 By allowing a 16 storey tower blocks, an unprecedented tall building in CJ town centre, you implicitly give full way for a new application to 2 or 3 tower blocks of 20-25 stories on Clapham Junction station. Some will actually remember that this was the initial plan for the station redevelopment (image on the left). An opportunity for Clapham Junction? In other words, this will be a cheap hotel for people looking for an affordable way of commuting to central London, with the station just hundred yards away. The scheme is not focus on Battersea or Clapham Junction vicinity and will not provide any support for the regeneration of this part of Clapham Junction, despite the claim from the developers. In addition, little consideration has been given to the noise and disturbance in parking caused by a 132 room hotel. Not only the hotel will operate 24 hours a day, which will be a huge change from the current daily office occupied by a solicitor, but there will be potential noise from the delivery vans, servicing, etc. With the current levels of traffic along Falcon Road, it will automatically increase traffic all along the road (Mossbury is a one way street) and create additional pressure on the limited parking. I live in Mossbury Road, and did not receive any specific information in the past year. However, as I might have just missed it, I personally asked several residents of the street. In all cases, it appears that the only thing was an exhibition on the ground floor of the building (Woburn House) last year, before the solicitors moved in, advertised by a poster on the window. In addition, I was told that a consultation was organised at the Town Hall, advertised by personal invitation sent to the existing Clapham Junction Town Centre Partnership members. It is therefore very, very far from a full consultation. The only recent information I received was the New Hotel Proposal brochure (that I scanned and make available here), apparently distributed on behalf of the developers, and the official planning application letter sent to the Council (see here). It gives 2 weeks (and a bank holiday weekend) to submit comments and study the proposal. The application might come before the Committee as soon as 25 June 2009! This statement seems to imply that constituents were widely consulted in the process of defining Council guidelines on planning applications. None of that actually happened, and in order to show examples of what is called “extensive public consultation”, there is only need to consider two recent events. 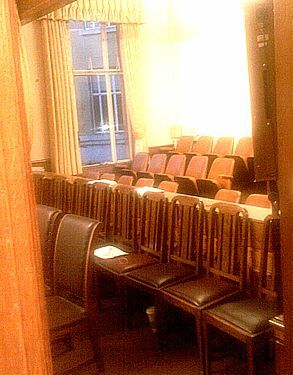 First, the Planning Forum, the object of which is to discuss the wide issues of planning process in the borough was organised last month… after 18 months absence. People attending received a personal invitation, and had to represent an organisation or group. I was told that the minutes will be published in … 6 months, therefore, as far as I’m concerned, I am the only one to have reported on it. The second example is easily provided by the recent notice (through the Council website, not publicized in Borough News) that a public hearing will be organised for the review of the Council Core Strategy document. As we try – with difficulty – to follow it, you will find information on our website (and thanks for pointing out if you find any other source…). The meeting was meant to happened next week but has been already cancelled. Instead, an exploratory meeting will be held at the Town Hall on the 16th June: you can attend but not participate. Once again the consultation for a planning application that may have consequences not only on the adjacent streets, but on the all future of the town centre seem to take place in mild confidentiality. Local residents deserve more than 15 days do discuss such planning. 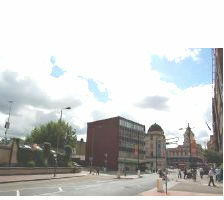 The Council should not approve a scheme that has not definite support for the redevelopment of Clapham Junction town centre, and must acknowledge the concerns that have been expressed so widely in the recent weeks and months on the need of development that respect the Victorian town centre of Clapham Junction, with a coherence of mainly low rise buildings. Once again and for all the previous reasons, this plan must be refused by the Council in its current presentation. Wandsworth Planning Committee members, writing to Martin Newton, Committee Secretary: MNewton@wandsworth.gov.uk and/or the chairman of the committee, Councillor Leslie McDonnell. All contact details available HERE. As explained in our previous article, a new hotel has been proposed at the bottom of Mossbury Road, 155 Falcon Road (in front of PCS). We publish below a mix of photos and sketches, taken from the application documents on the Council website, reference 2009/1291 (click on the images to see bigger). On several images, we compare the current views with the changes made by the hotel proposal. Montages based on images from the developers and building print. A new hotel has been proposed at the bottom of Mossbury Road, 155 Falcon Road (in front of PCS). The application has been submitted to the Council with the reference 2009/1291. Demolition of existing buildings, and construction of a 16-storey building (plus plant and basement) providing a 132-bedroom hotel, with ancillary restaurant/bar and conference facilities; and a separate shop or restaurant unit fronting Falcon Road at ground floor level. The new building responds to adopted planning policies accepting the principle of taller buildings in town centres, especially where economic and regeneration arguments add further weight. The design is a contemporary response to the requirements of the brief and to the need to consider the constraints of the Conservation Area in which the site is located. The building envelope uses a range of materials, volumes, rhythms, colours and tones referenced to existing nearby buildings, including the Debenham’s department store (formerly Arding and Hobbs), the Falcon public house and The Grand Theatre. The architects have undertaken a comprehensive review of the constraints of the brief and the site, and paid particular attention to the setting of the building within the Conservation Area and its relationship with existing buildings including nearby but unadjacent listed buildings. The hotel entrance and servicing will be off Mossbury Road and the ground floor contains reception, restaurant and kitchen areas, with plant and service facilities below. 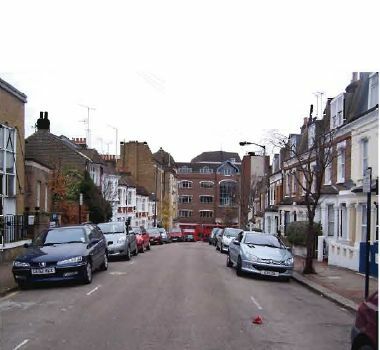 The development is restricted to three levels at its abutment with the terrace of houses on the rising frontage of Mossbury Road, reflecting the rhythm of the street. The application has been filed by Oak Trading Company Ltd, a part of The Redwood Property Group. “The design has evolved after a long period of design refinement following scrupulous consultation with the fullest range of local and other bodies, including potential operators. You might have noticed that David Rosemont has already commented some of our articles on this website, here and there (bottom of the articles, section comments). Nothing to do with Clapham Junction and towers (so far) but I would like to take to opportunity of the audience of this website to join LoveClapham and remind you about the European election in a few days. There are 72 Members of the European Parliament (MEPs) representing the UK to elect. The UK is divided into 12 regions for the vote, with anywhere between three and 10 MEPs representing each region. The MEPs will be elected for a period of five years. You will only need to put one X on your ballot paper when you vote, selecting which political party or independent candidate you favour out of those on offer. The winners will be selected by a system of proportional representation. Lists for London can be found here. You will find information about the role of a MEP here. All the 736 MEP will be elected between June the 4th and the 7th in the 27 countries of the European Union. If you want to see how your MEPs vote and represent you in the European Parliament, it is here: http://www.votewatch.eu (an independent monitoring website of EU politics). It provides detailed information about parliamentarians’ voting records and formal political activities – from committee work to parliamentary reports – and includes easy-to-access information on the political coalitions that are formed around policy issues. All citizens of the EU who have registered in the EU country they live in can vote. And in case you wonder what Europe has ever done for us and why you need to vote, just look here. 2 articles regarding the withdrawal of the Clapham Junction station redevelopment application (click on the article to see it bigger). 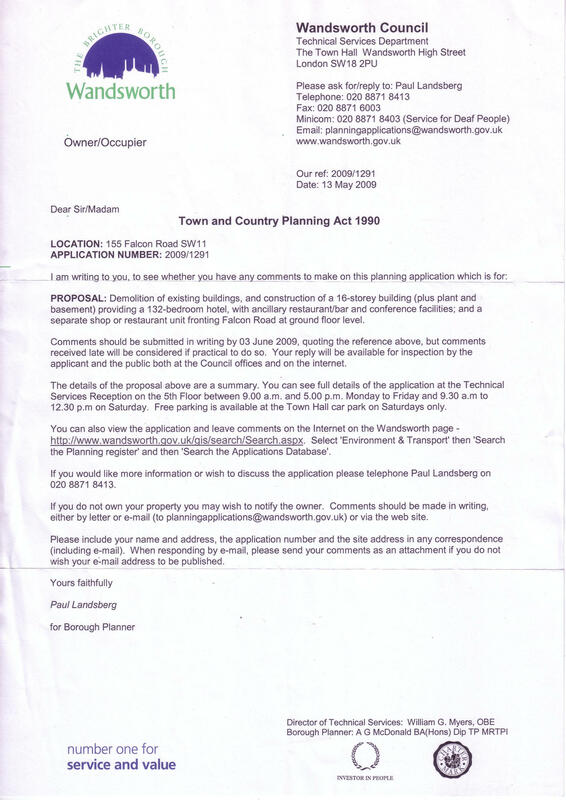 Special edition – Clapham Junction planning application WITHDRAWN by the Developers. Welcome to our latest bulletin with a report on the withdrawal of the Clapham Junction planning application together with information about half term activities; the Wandsworth Heritage Festival; the Northcote Road carnival & the Lavender Hill festival and the move of Battersea’s Citizens Advice Bureau to Northcote Ward. Please forward the bulletin to friends and neighbours. Among all the topics, the main one was commenting the Clapham Junction redevelopment proposal (I included links to articles on this website). 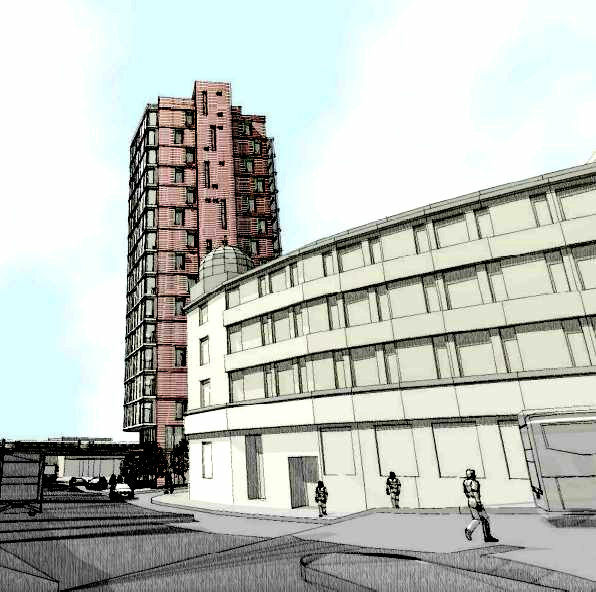 We learnt late on Monday afternoon (May 18th) that the developer, Metro Shopping Fund, had withdrawn its Clapham Junction planning application. b.	affordable housing was omitted from the scheme. 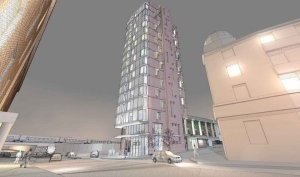 A spokesman for the developer is reported as saying “We are deeply disappointed therefore that the report to the committee was not able to give the proposal its backing”. As ward councillors we have taken an active role in connection with this application by urging local residents and businesses to make their views known to the Planning Department as well as speaking about the application at the Ward report back meeting last November and at the public meeting in January this year. Martin Johnson, who is a member of the Planning Committee, was intending to propose additional reasons at Wednesday’s meeting for refusing the application including the scale, design and massing of the proposals and the sheer inadequacy of the proposed improvements to the station access. At the Wandsworth Council meeting on May 13th Philip Beddows presented the online petition, organised by the Clapham Junction Action Group, opposing the proposals. Peter Dawson made a written submission to the Planning Department on May 5th opposing the proposals much of which was quoted in the Planning Officer’s report to committee. The main points in his letter relate to the scale, height, design and density of the proposed 42 storey tower blocks being inappropriate at this location and out of character; the lack of new prime office accommodation and the loss of current office space and jobs from the town centre; the inadequate proposals relating to the bus / rail interchange and the partial nature of the station proposals. The full text of the letter is available at the Planning website. Overall we had come to the conclusion that though improvements are desperately required at Clapham Junction station, not least because of passenger safety concerns, this application only partially addressed the problems at the station while the impact of the overall scale and type of development on the surrounding residential and local shopping areas was unacceptable. 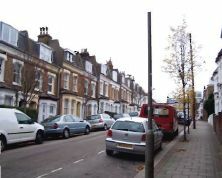 Battersea’s Conservative Parliamentary spokesperson, Jane Ellison, wrote to the Council’s Planning Department on May 5th setting out her objections to these proposals. In our next e-bulletin we will include a commentary on the planning process and what might happen next. 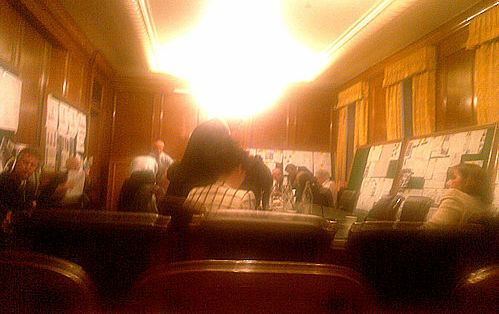 The Planning Applications Committee meeting was hold on Wednesday 20 May at the Town Hall. As confirmed by Councillor Leslie McDonnell, chairman, the application for Clapham Junction station redevelopment was withdrawn by the applicants (Metro Shopping Fund) on Monday (follow the link to read our comment). The meeting started at 7.30pm. After agreeing on the Minutes of the previous meeting, Cllr McDonnell said that on Monday at about 3.30pm the applicants withdrew their application for Clapham Junction station, and therefore this item would not be debated. However Cllr Belton made a short statement highlighting that more than 600 residents objected (actually more than 800 objections) and he wishes that such application does not set a precedent. Cllr McDonnell replied that there is no relation between Planning Officer and Councillors. For the next 1 1/2 hour it went on with the other applications. 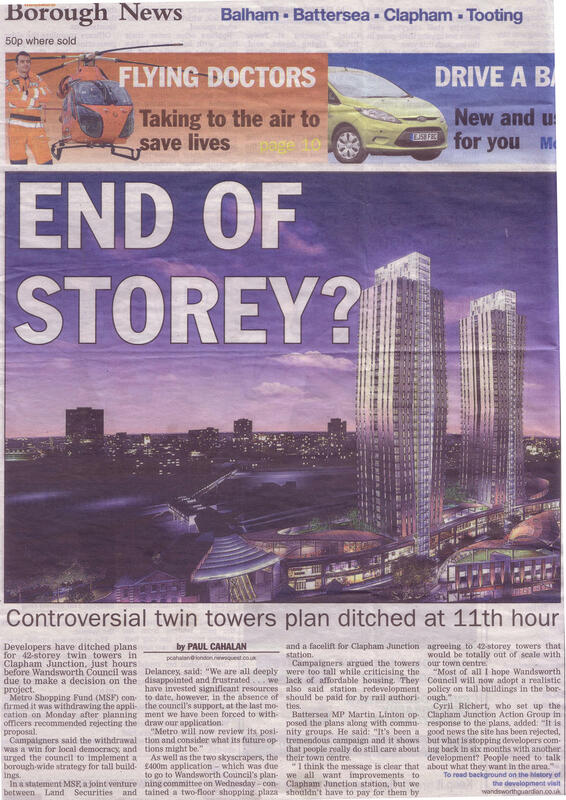 The discussion was extensive on Trade Tower Plantation Wharf which was criticised for scale and proportion issues within the vicinity which led eventually to refusal (it is encouraging that several councillors made the points). Finished at 9.15pm…. I cannot imagine what time it would have finished should you have had the full agenda. An email was sent to everyone on our mailing list, in addition to the topic posted on the website, stating that the item was withdrawn from the agenda. Apparently more than 60 people decided it was still worth showing their concern!